MSCS Ltd has invested heavily in EMC test. In 2014 we opened our new Open Area Test Site or OATS. Our large scale OATS provides radiated emissions, radio and antenna measurements up to 10 meters. Due to our own 8 acre site, an obstacle free area is provided as required by the standards such as CISPR-16. Situated in the rural area of Northamptonshire, the OATS has low electromagnetic ambient noise, crucial for radiated emissions measurements. Measurements at 3m and 10m Obstacle free, low ambient noise environment. 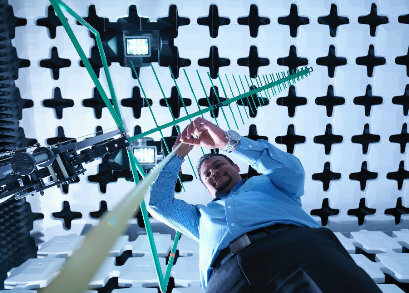 We conduct EMC testing to all of the frequently used European, North American and CISPR Standards. Our reports are accepted by regulatory bodies and gain access to world-wide markets, including Australia (C-Tick), Japan (VCCI) and others. We test larger pieces of plant and equipment in-situ. This is a particularly valuable service, as it saves the time and expense of moving installations around. Many industrial and scientific pieces of equipment require special services, such as gas and water supplies. Our in-situ testing overcomes those problems. We are trained and have experience in many industrial environments and frequently work as contractors into major manufacturing organisations. Our Services are available throughout the European Union and in North America. Good EMC design is essential, so why leave it to chance? We offer a user-friendly EMC consultancy service giving practical advice during the design phase. We assist the mechanical designer(s) in best EMC practice - at surprisingly little cost. The long-term benefits are considerable. How many times have you had to re-track because of and EMC failure? Never again! Our ‘look-see’ EMC testing will reveal almost everything that a formal test would, and at a fraction of the cost.